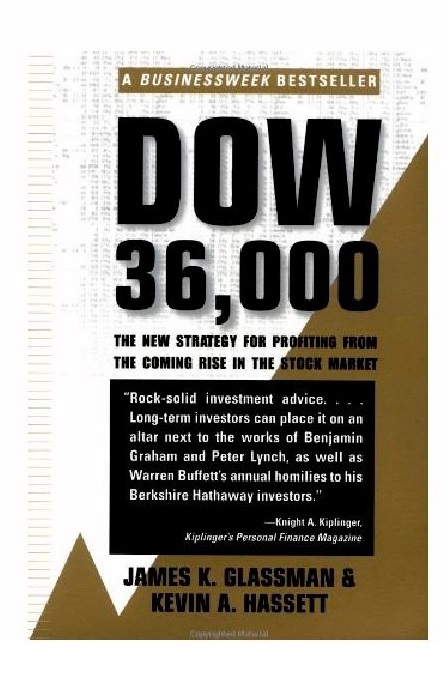 Few books have received more criticism and mockery than Dow 36,000, published in late 1999 in the midst of the technology craze. 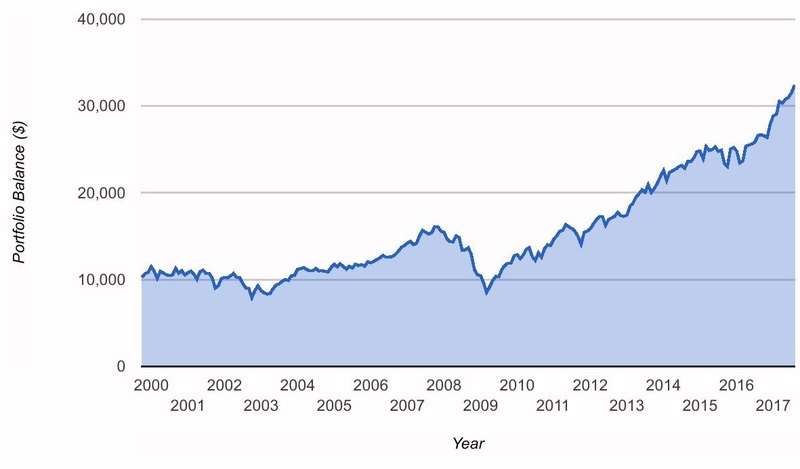 Its central point was that stocks should be trading at much higher prices given their long-term return consistency. The authors chose 36,000 as an approximate figure that was a far stretch from the 10,300 level on the Dow Jones Industrial Average in October of that year when the book was published. Setting aside the idea that current prices are "wrong" (always a mistake) and should be 3x as high, "36,000" is often considered a hyperbolical statistic that demonstrates unbridled bullishness as opposed to realistic return expectations. Indeed, the Dow is only flirting with 22,000 today, less than 50% of the way there over the last 17+ years. But let's look at this from a different angle. How many investors who monitor the Dow forget that it is a price-only index, and it doesn't include the total return that shareholders earn including dividends? If we looked at the complete return on the Dow including appreciation and dividends since 1999, we'd be pretty close to 36,000 today (32,364) after returning +6.6% per year. This despite record-high valuations at the time, as well as a 40% drop in prices that began just a few months after the book was published, and another 40%+ drop in 2008. And if we're looking at this topic practically, should we restrict our definition of stocks to just 30 US large companies? What if we instead start with the broader S&P 500 Index, and further add US and international large and small cap value stocks to create a globally diversified, small/value tilted portfolio? 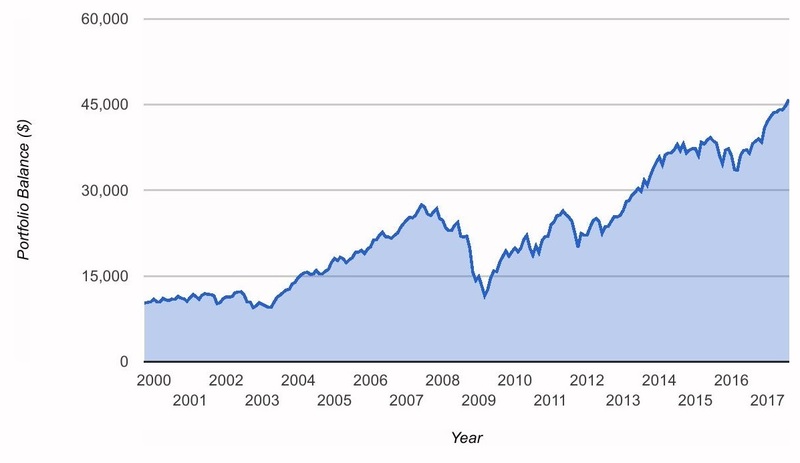 Had we started with 10,300 in this portfolio in October of 1999, we'd be at almost 46,000 today thanks to +8.7% annual returns! How is this possible? Doesn't it seem as though large-cap US stocks (including the S&P 500) have been the best-performing asset class in recent history? That is true if we only look at the last few years (as most investors do). But from 2000 to 2010, the Dow Jones Industrial Average (including dividends) appreciated just 31% (+2.3% per year), while the globally-diversified portfolio returned over 125% (+7.4% per year). The recent high returns on the Dow and other large cap indexes like the S&P 500 aren't a sign of long-term performance superiority, but instead, US large cap indexes playing "catch up" after a dismal start to the century. Overall, there are several lessons from Dow 36,000. Don't dismiss bullish estimates out of hand -- stocks have a remarkable track record of wealth accretion if we consider all sources of return: dividends and capital appreciation. It turns out that the much-maligned 36,000 figure was a reasonable total return estimate for today (not that the authors were making this point), even after experiencing two of the worst five bear markets in 80 years. Don't restrict your view of stocks to a handful of familiar, large US companies. As history has shown, diversifying more broadly across small cap and value stocks globally have generated much higher long-term returns and a smoother overall ride. Since Dow 36,000 was published, the globally-diversified mix returned almost 2% per year more than the Dow Jones Industrial Average despite the latter's stand-out results in recent years. Do ignore any authors, journalists, advisors, or pundits who claim that markets are mispriced, or prices are wrong and deserve to be at substantially different levels than currently quoted -- prices change but not in a way that anyone can consistently forecast in the short run. The chart below plots the Dow Jones Industrial Average total return (BLUE) as well as a balanced portfolio that is just 50% invested in the globally-diversified stock mix mentioned above, and 50% in short-term global bonds (RED). 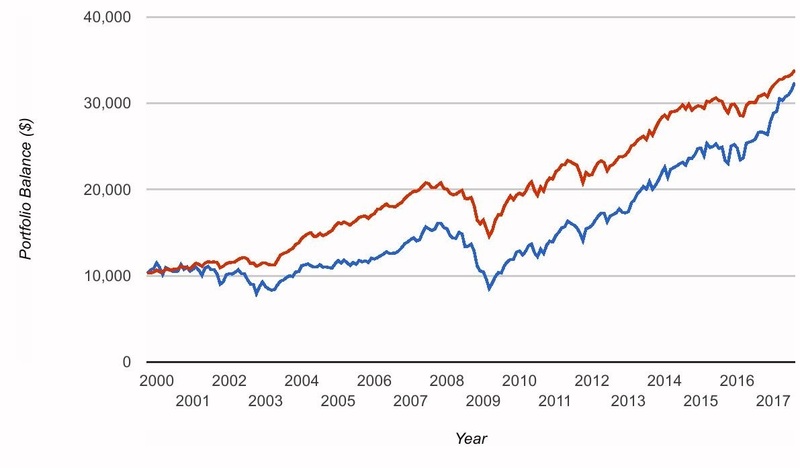 By diversifying more broadly and targeting the sources of higher-expected returns in stocks (specifically smaller and more value-oriented stocks), you've been able to achieve either higher long-term growth, or similar growth as the overall market with much less short-term volatility (because only 50% is invested in stocks which reduces portfolio variability). The right allocation for any investor is a function of their needs for growth and their willingness to tolerate short-term market fluctuations -- a decision made easier after consulting with a knowledgeable and experienced financial advisor.